The number of Connecticut high school students who used vaping products, such as e-cigarettes, doubled from 2015 to 2017, according to a new study released by the state Department of Public Health. Overall, 14.7 percent of high school students reported “currently” vaping in 2017, compared to 7.2 percent in 2015. In contrast, 3.5 percent of high schoolers reported currently smoking traditional cigarettes in 2017. DPH compiled the 2017 report using data collected from March to June 2017. The state defines “current use” as having used a product at least once in 30 days. The Food and Drug Administration (FDA) recently labeled youth e-cigarette use an epidemic and put the manufacturers on notice about potential actions they may take in order to reduce youth access and use. Although some preliminary studies have indicated that e-cigarettes may be safer than combustible cigarettes, the Surgeon General has concluded that nicotine poses a danger to youth, and its use in any form by youth is unsafe, according to the DPH study. “The issue with e-cigs, because they have exploded on the market over the last five or so years, compared to regular cigarettes which have decades of evidence-based data, we have been limited until very recently in knowing what the right approach should be,” said Dr. Mehul Dalal, chronic disease director at DPH. 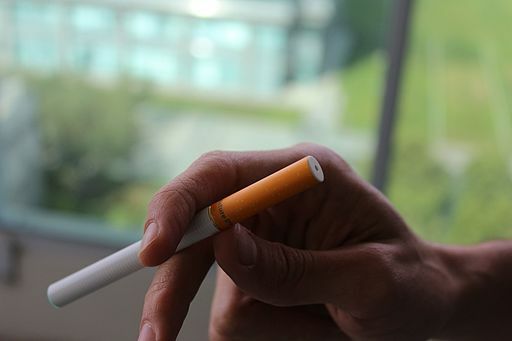 Dalal said that many national groups, including the Institute of Medicine and the American Medical Association, have supported raising the legal age to purchase tobacco products from 18 to 21. State public health officials are actively discussing that recommendation, with the next legislative session about three months away. A bill to raise the age made it through the Public Health Committee, but was never voted on, during the last session, which ended in May. The Centers for Disease Control and Prevention also has recommended educating parents and school officials about the risks of vaping and nicotine to help curtail use. Dalal said state officials plan to follow that recommendation. One popular brand of e-cigarettes, JUUL, contains the same amount of nicotine in one pod as a pack of cigarettes, and many teens report that they use one pod each day. These devices are shaped like a USB drive and are easily concealed, and teachers have reported use in the classroom while class is in session, according to DPH. According to the DPH study, those who vaped said they started because a friend or family did. The most popular flavors were fruit, mint, and menthol. More than half of the youth also reported that they used their electronic devices for other substances, such such as marijuana, THC or hash oil, or THC wax. on the dangers of (e-cigarettes), and reducing exposure to secondhand smoke and aerosol are all very important for protecting children’s health,” Pino said.